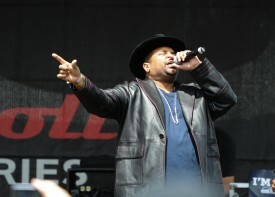 LOS ANGELES – August 26, 2015 — More than 10,000 Halloween-clad runners will celebrate 13.1 musical miles with an epic performance by Sir-Mix-A-Lot at Rock ‘n’ Roll Los Angeles Half Marathon’s Toyota Concert Series. The finish line festival concert is open to the public and will take place on an outdoor stage at L.A. Live following the race. Long before his comic novelty song sparked a cultural debate about women and became a phenomenon that radio and record companies couldn’t deny, Sir Mix-A-Lot, aka Anthony Ray, was already a platinum selling artist. Sir Mix-A-Lot founded his own label, promoted his own music and produced all his own tracks. While many of his songs found success, it was “Baby Got Back” that catapulted him to the mainstream, selling over two million copies and winning a Grammy. The race starts downtown at Staples Center at 7:30 a.m. and takes participants on a running tour through USC’s campus, around the Coliseum, Art District and 6th Street Bridge before returning to L.A. Live for an energetic finish line festival. Local live bands and hundreds of high school cheerleaders and motivating spectators will line the route to encourage runners to keep going. Runners are encouraged to dress up in costume to conquer the course and participate in a costume contest at the finish line. Race weekend kicks off with a free Health & Fitness Expo on Friday, Oct. 23 and Saturday, Oct. 24 at the Los Angeles Convention Center. The free expo is open to the public and will showcase the latest in running products, services and free samples from fitness experts as all registered runners pick up their race number, t-shirt and timing tag. For more information or to register, please visit RunRocknRoll.com/Los-Angeles or follow @RunRocknRoll on Twitter. The Rock ‘n’ Roll Los Angeles Half Marathon & 5K will welcome more than 10,000 participants on Sunday, Oct. 25, 2015. ASPCA is the official charity of the race. Live bands and cheerleaders will entertain participants along the Halloween-themed race route, which starts and ends at L.A. Live in downtown Los Angeles and travels past many of the city’s landmarks. The race concludes with a post-race concert from headliner Sir Mix-A-Lot. A two-day Health & Fitness Expo kicks off race weekend at the Los Angeles Convention Center on Friday, Oct. 23 and Saturday, Oct. 24. The free expo is open to the public and will feature the latest in running apparel and nutrition products. For more information, or to register online, please visit RunRocknRoll.com.